The Atlanta Falcons signed tight end Chase Coffman and wide receiver Tim Toone to the active roster on Tuesday. With defensive end Ray Edwards being released and tight end Tommy Gallarda being placed on injured reserve, the Falcons had two open spots on the active roster. Coffman was signed by Atlanta on August 11. He was a member of the practice squad prior to being signed to the roster. Toone was signed on July 25. He was then waived-injured by the Falcons on September 6. The Atlanta Falcons have released defensive end Ray Edwards. Edwards was signed to a five-year, $27.5 million contract last season – the Falcons’ “splash” of the offseason. 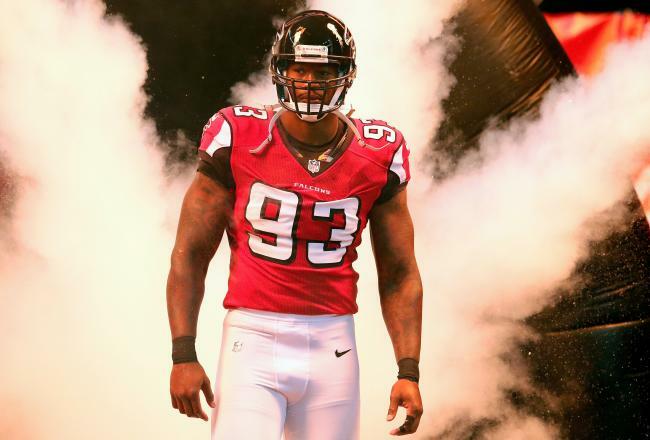 Since signing with the Falcons, Edwards has just 3.5 sacks after he notched 29.5 in five years with the Minnesota Vikings. He failed to record a sack this year. This season, he was primarily used on rushing downs: Pro Football Focus has him playing just 36.7% of defensive snaps. I can’t say I’m surprised by this move; he has been greatly outperformed by Kroy Biermann. I also likes the message it sends: no one, regardless of contract, is getting a free ride. Perform, or you’re out of here. The Week 7 bye came at a great time for the Atlanta Falcons. It gave the team an opportunity to refocus and fix some glaring issues. More specifically, it gave the Falcons an opportunity to work on tackling fundamentals. According to Pro Football Focus, the Falcons have missed 52 tackles through the first six weeks of the season. They’re on pace for 138 missed tackles, which is 31 more than they missed last year. The Falcons are missing tackles because they aren’t wrapping up for the most part. The biggest culprits are Thomas DeCoud, Dunta Robinson, and Sean Weatherspoon; they often take a chance to lay the wood rather than just bring the ball carrier down. 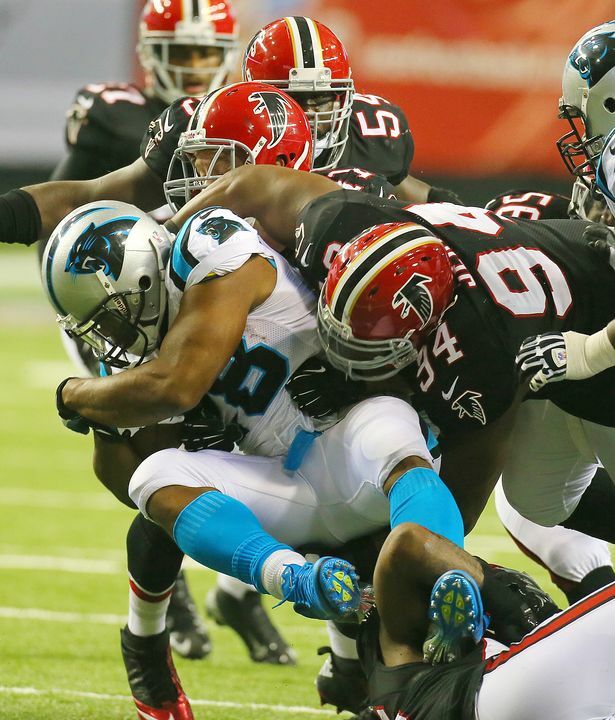 According to Jay Adams, multiple Falcons addressed the tackling issue on Monday during an open locker room session. There’s no doubt in my mind the Falcons will start tackling a lot better in the second half of this season. The Atlanta Falcons (4-0) defeated the Carolina Panthers (1-3) by a score of 30-28 in an absolute thriller of a game. Matt Bryant kicked the game winning field goal (40 yards) with just 10 seconds left in the game. The Panthers had one last prayer, but John Abraham sacked Cam Newton to end the game. The Falcons started the game-winning drive on their own one yard line with 59 seconds left on the clock. Matt Ryan threw a deep bomb to Roddy White on the first play, who made the catch for 59 yards. A defensive pass interference call on Captain Munnerlyn, a seven-yard reception by Tony Gonzalez, and a six-yard reception by Harry Douglas set up the 40-yard field goal for Bryant. The Atlanta Falcons defeated the Miami Dolphins Friday night by a score of 23-6. The win marked the first preseason victory for the Falcons since 2010. The third preseason game usually features the starters playing a bit into the second half, so it’s as close to a regular season game as you’ll get. Final score aside, how did the Falcons fare against a bad Dolphins team?